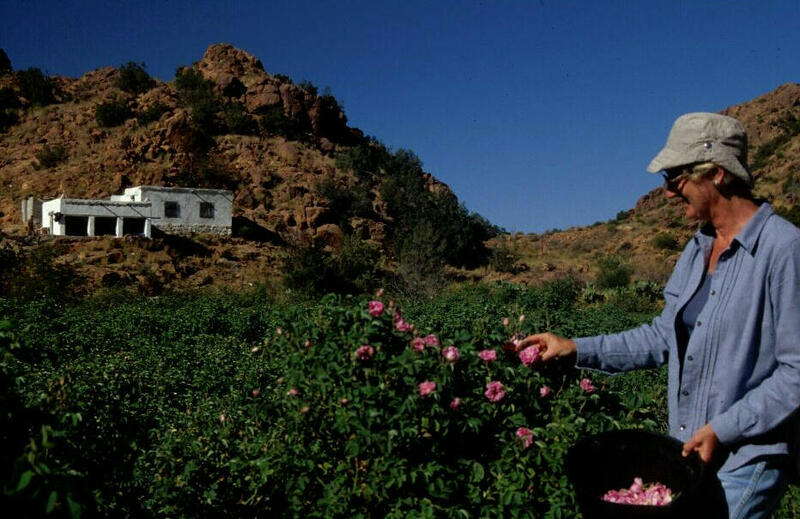 Before leaving my native Mexico for Saudi Arabia, I read an article about roses being cultivated outdoors in the western part of the country, in Taif. Although I knew there were a variety of agricultural projects in that general area, I was still fascinated by the very idea of Roses in Arabia. In my mind I could not picture flowers being raised in a harsh and dry climate, at least not as easily as they are in countries where nature lavishly assists just about anything you want to grow. 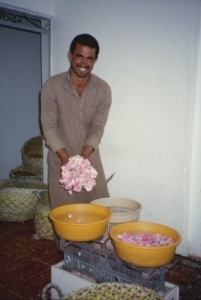 My husband, John, by then, had gotten a contract to work in Jeddah, which is relatively close to Taif, and I was eager to join him before April, the main month of the year when rose buds bloom only at dawn, making it easy to pick them at precisely the right moment. 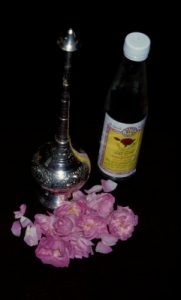 Their marvelously scented oils are then transformed into rose water from which attar, a highly appreciated perfume, is obtained. Yes, I wanted to be a witness to what I considered to be a magic phenomenon. 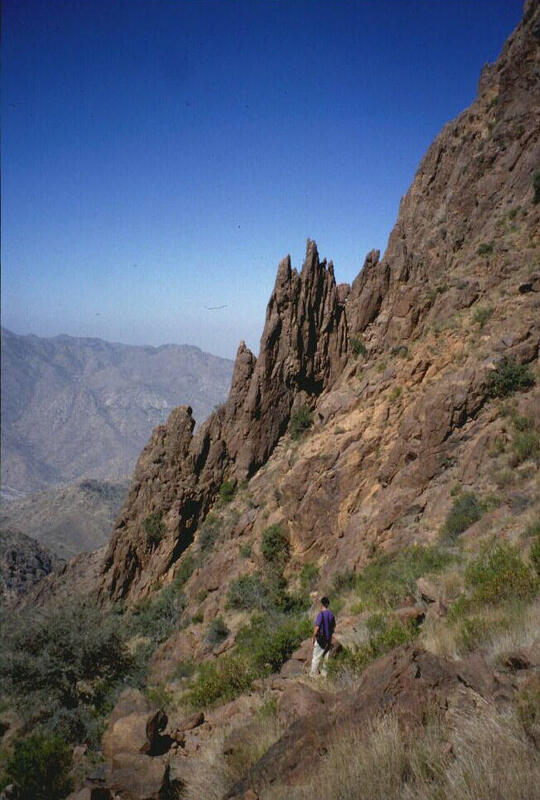 One afternoon in the middle of April, my husband, and our two good friends, John and Maggie Jenkins, drove up the spectacular escarpment which leads to Taif. The Jenkins knew the caretaker of one of the rose farms, and they had invited us to come along. We were following the Jenkins in our own vehicle, a hardy Blazer stuck (by the former owner) with the unlikely name of Petunia. At the very top of the escarpment, a gang of furry baboons, including some mothers carrying their babies, looked at us as if they expected every visitor passing that way to give them a treat. We couldn't join the people who stopped to feed them or to look at them because the Jenkins had warned us about the many twisting dirt roads which we would have to take in order to reach the rose farms. "And there'll be a few mountains to go over as well", they told us. "Will we be needing four-wheel drive, then, John?" we asked, a bit nervously, because we had been warned that ours wasn't working properly. "Not to worry," replied our friend, "the roads are a bit rough, but if it looks like you can't make it, we'll just carry on in our vehicle." They were right about the rough part. We had just entered the outskirts of Taif when the Jenkins took a paved road which led up into the mountains and suddenly ended. Then we started following a dirt road which rose and fell and curved this way and that. At first, this road was quite nice and we hoped it would continue like that so we would not even have to think about four wheel drive. To our dismay, though, the road started getting really rough and, at some point, we realized we were perched on top of a high hill from where we could see a town way down below. Yes, we would have to go down there and cross the town in order to continue. "Hang on, Petunia! ", we cried. Seeing the Jenkins bouncing happily among all those big rocks with their Jeep didn't encourage us much, and my stomach developed multiple cramps as the road got even rougher when we began the steep descent. At this point, there was not a positive thought in my mind. Suddenly, the Jenkins stopped to talk to someone who was driving a pick-up truck which was working its way up the steep slope. "What!... Are we seeing things?" I asked my husband. But it was true: it was a simple Toyota pick-up! This, I must say, did give us new hopes... which were quickly dashed the moment we entered a very narrow stretch of road along the mountain side. Here we found rocks even bigger than the ones we had laboriously succeeded in passing. We were convinced that that a simple pick-up could not have gone down this road, and much less up it. No way! And we were also convinced it was time to throw Petunia into four wheel drive, whether it worked or not, because otherwise we would have to turn around and go back -- a mighty dangerous proposition on that narrow ribbon of road. We were lucky: The 4WD low gears engaged and suddenly Petunia began to lumber along like a powerful, unstoppable tank. So, we continued, now far more confidently, following a road which at times was so narrow that Petunia had to scrape along the side wall to keep us from plunging to the bottom of the gully. We finally saw the first rose fields nested among the wadis protected by the mountains. The dark green bushes were covered with tiny pink buds of Rosa damascena trigintipetala --known as ward taifi to the locals-- which were waiting to open up the next day, before the sun's rays diminish the oils which contain the esence of their perfume. A soft breeze was blowing, filling the atmosphere with the pleasant aroma of the flowers. This idyllic scene completely changed my state of mind. From that moment on all I concentrated on was absorbing the beauty which the rose farms had added to the already magnificent mountain panorama ever since the rose farming began, three centuries ago. It was late afternoon when we arrived. The idea was to camp near the farm we were visiting and the next morning, at dawn, of course, we would get up to help the Jenkins' friend to collect the new roses of the day. The stars were still sparkling through the dark mantle of night when we started walking toward the farm. When we arrived at the place where we would meet the rose farmer, my husband and I looked at each other with amazement when we noticed that the vehicle parked in the farm was the very same Toyota pick-up we had seen the day before, and their friend was the very same driver. "It cannot be possible!... Those pick-up trucks must be magic! ", we cried with chagrin. 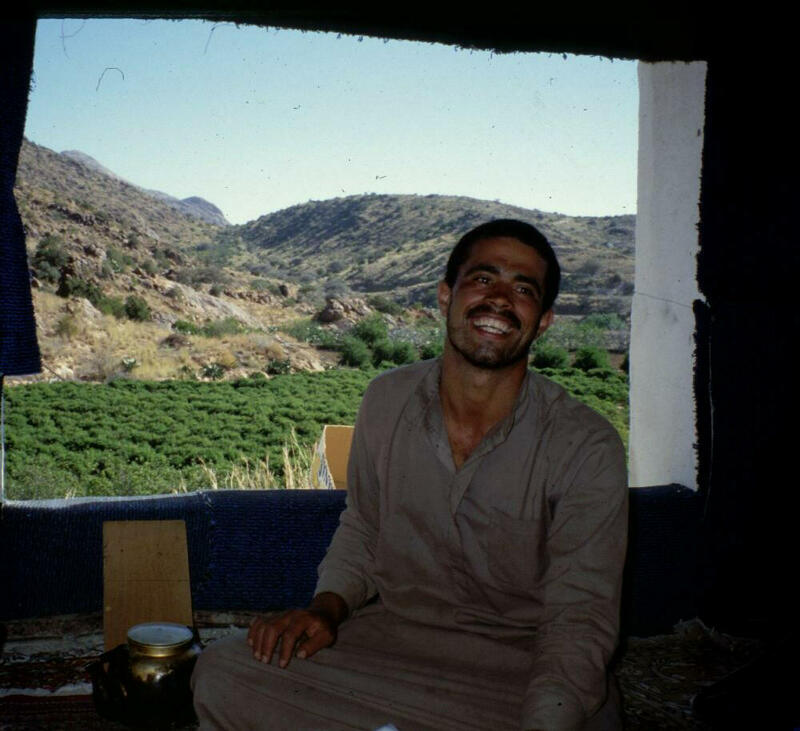 Ali abd al-Hamid was the name of the farm's caretaker and he was already at work when we arrived. 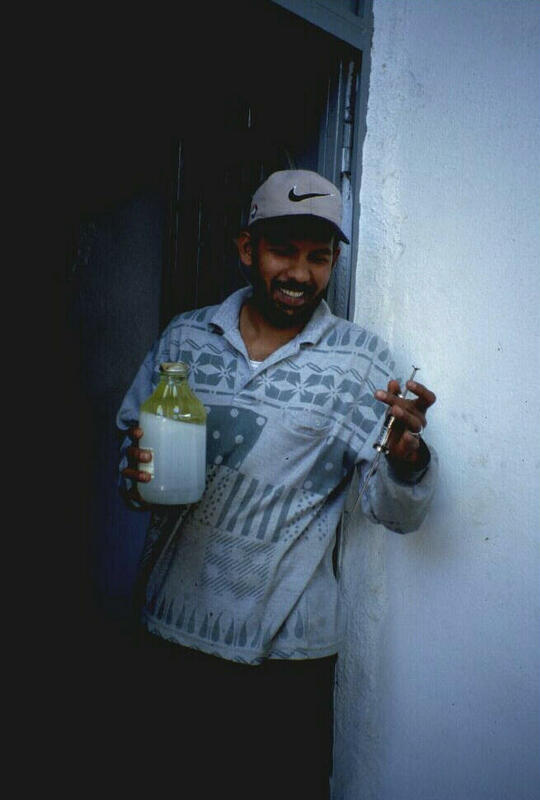 He was a lively young man with a broad smile and he seemed delighted to see us. Ali passed out baskets in which we would place all the roses we could pick before 9:00 AM, when they had to be taken to the al-Gadhi plant, where we were invited to observe the distillation process. 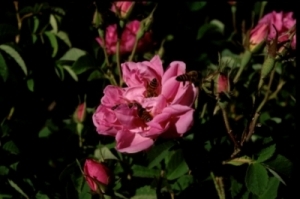 As soon as the first rays of the sun had touched the roses, the bees began their daily job of pollination. It was quite a strange feeling to work in competition with them, going from one rose to another for a very different purpose. And I must say I felt bad about taking away the bees' source of food as well as plucking such beautiful and delicate flowers from what, up to that moment had been their source of life. 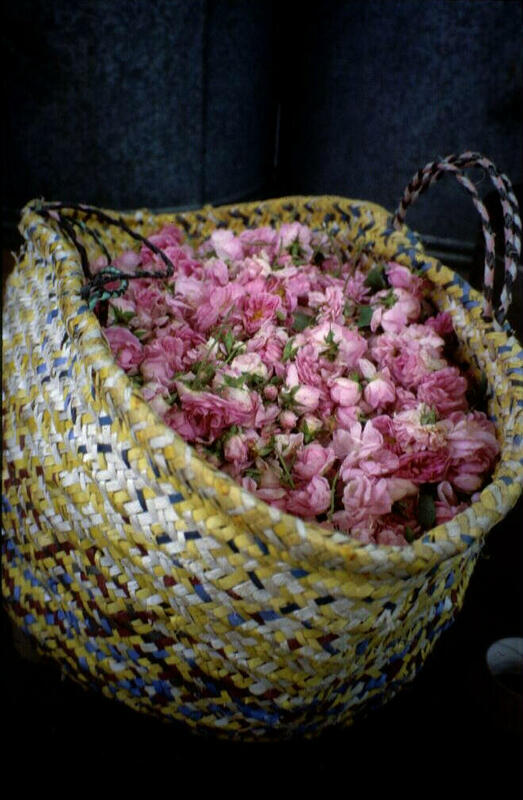 However, when I saw a basket full of them and I caught the scent of their amazing perfume, I could not stop myself from picturing them in my mind being transformed into rose water and attar --from Arabic 'itr, "essence" or "perfume"-- which have been used for centuries in so many countries. And then I had a lovely inspiration: "those roses were destined to live for many many years and to make many people happy." When we had picked all the buds we could find, we took a short hike to the edge of the steep, rugged, Harithi escarpment where an ancient camel trail --or what remains of it-- winds its way down through flowers, bushes and tall waving grasses to the canyon floor, thousands of feet below. The magnificent view was framed by towering pinnacles of rock and all we could do was stare in awe and click our cameras. Then we joined Ali for tea, during which he regaled us with tales of battles fought to protect his precious roses from porcupines and baboons. The visit to the distillery in Taif was the next exciting chapter in our adventure. Just inside the entrance of the factory, there were two people with scales since the quantity of roses is normally calculated by weight. Inside, several other people were in charge of carrying out the distillation process. There were several tin-lined copper pots which can hold about 50 liters of water each. The process of distillation is, really, very simple. To those 50 liters of water aproximately 10,000 roses are added. The pot is then tightly sealed with a cover which looks like a mushroom-shaped hat. This mix simmers for six hours. The steam collected goes through a tube which passes down through a pool of cold water and ultimately reaches a large glass jar called al-Arousa, where the rose water is collected. 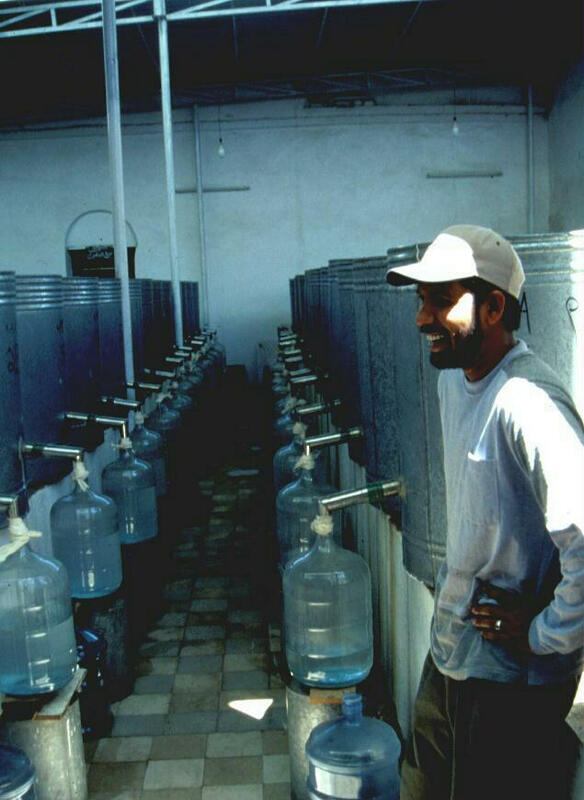 At this point the droplets of attar are still dispersed in the rose water, so a second distillation takes place, in which the globules of attar rise to the surface as the liquid cools down, facilitating their collection with a device similar to a syringe. 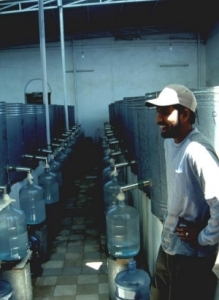 The attar collected in just one of these containers produces one single tolah (about 11.7 ounces) which, understandably, sells for between 2000 and 3000 Saudi riyals. At first, the main purpose for distilling these delicate roses was to produce rose water which is used at different festivities and celebrations, like the two "Eid" or at weddings, for example. It's also used as an ingredient in the kitchen for some dishes and, especially, for desserts, sweets and some drinks. 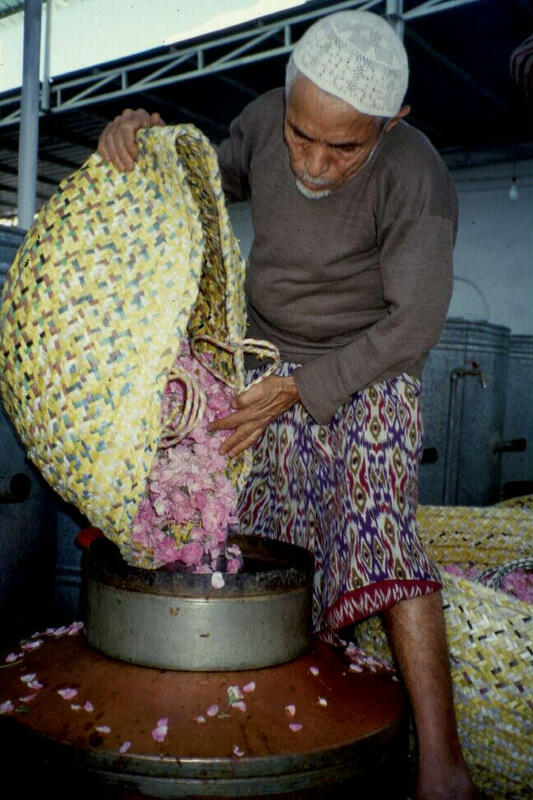 It is said that it is used as well to perfume the Yemeni Corner of the holy Ka'bah. According to a story, attar was discovered in the 17th century when a woman noticed a sort of a scum formed on the dishes where hot rose water had been poured. She collected it little by little, and was amazed as she realized that that scum had an extremely rich rose perfume. Experts claim that this scent is so penetrating that it stays in the clothing where it was applied even after the fabric has been washed for several times. I too can vouch for that. After coming back from our trip to the rose farm, I chose the best among the roses which Ali had kindly given us. I put these in a wicker basket but I couldn't bring myself to throw away the ones which, sad to say, now looked crumpled, brown and withered, so I tossed them into a clay bowl. Some days later I happened to need that same bowl, so I put those dismal-looking remains into another container and I washed the bowl. Days later, that humble clay pot still retained the unmistakeable, unforgettable scent of the lovely roses of Taif.